Hey ya'll ,came over to check on Sue. 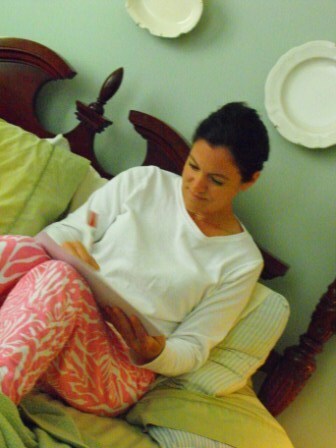 For those of you who do not know me I am her sister Missy from http://southernqueenbee.blogspot.com/. She was so worried about her blog friends. So I convinced (really I begged) her to let me be a guest. She never lets anyone mess with her blog.YEAH, I am so excited cause I get to do her 300th post. She is gonna be disappointed she missed that, believe me she would not let me on if she knew that. 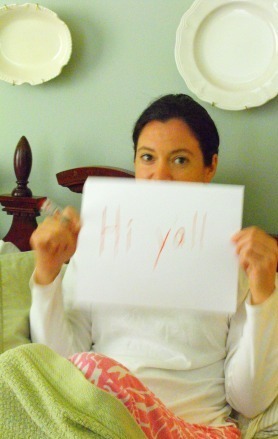 She says Hi... and she misses ya'll. The plan was to have her wisdom teeth removed. Well they removed two. One had a tumor on it, so the dentist stopped and stitched her up. She wants Sue to see a surgeon to remove the remaining two. But Sue said she will die with them before they touch her. I think the girl needs a Valium or something. Her sweet daughter is keeping her supplied with her favorite Sonic drink. If there are any Sonic Rep.s out there feel free to send her the "Route 44 Costumer of the Year" award. Get well soon Sue.....Oh this is killing her that she does not have control over what I am typing..well she could delete me(she has done that before). Check in on Monday she has something goin on in her foyer. Luckily she had it done before the dentist got a hold of her. Lets just say shes gettin better at mixing paint than the WalMart paint guy. Oh Susie, I hope you do feel much better soon! Sorry it didn't go as smoothly as we all prayed for. Now you can't be a big baby....you need to go to the surgeon and get it done so they can make sure nothing is wrong since the one area has a tumor. I will be praying for you to heal quickly and get everything done that needs to be done.♥ See ya Monday! Yikes! Sounds painful..take the pain pills and get well! I had a trauma story too...One wouldn't extract properly and w/o telling me they had to cut into my gums. What a painful surprise to find when you're safely at home. Did i mention i can't take pain meds: I get extremely sick! Then i got a dry socket. Oh be careful with those straws sweetie. Wouldn't want this to happen to you. Good news: You've got Sonic! How i wish they'd build one where i am. We have commercials, but have to drive to OR to get some. Get better soon! Get well, soon Susie! You did a great job, Missy! Get better soon! See you Monday! Oh I hope you feel better soon! I have never heard of a tumor on top of a wisdom tooth! Hope it works out!! Praying for you! I had all 4 of my wisdom teeth taken out when I was a young pup of 17 and was in agony for 3 days. I feel so bad for you. Take it easy and be well. Praying the tumorous area will be ok.
You did a great post for your sis...and I know she thanks you..I do, too..
Tell her I'm sorry she is going thru this..and that I am thinking of her..hope they gave her some SERIOUS drugs!! I know how you feel Susan. I had all 4 of mine surgically removed and the nerves were wrapped around the roots of the teeth and they tore them when the teeth were removed so now I am numb on my right side of my bottom lip and part of my chin. Hope you feel better soon! Rest and let everyone wait on you! Ha ha!! Feel better soon Susie - sounds like that was not such a fun time at the dentist. (Is it ever??!!) Glad to see that you are being well taken care of!! The Dreaded Dentist!!!! I am going to have to start "big" knock out meds when I go. I am so sorry and hope Susie feels better soon. Sonic Rocks! Love their "happy hour" prices. They owe you all big for the press. Take care and I will be thinking of you. We will be looking forward to seeing the foyer. Yikes! Get well soon Sue! Oh you poor thing! There is not much that is worse than mouth pain...except maybe pushing out those babies we love so much. Hope you feel better soon. Great guest post Missy! Sweet Susie - I am so sorry you didn't have a good experience! I'll be praying that you feel better asap and that you do go on and have done what needs to be done. Oh, I'm so sorry it didn't go as planned. I hope you feel much better soon and hope all goes well with the surgeon. Pain meds are good things! Oh poor Miz Susie! This is exactly why I've been putting off having my own dental work done because I'm afraid of what will happen. As long as there's Advil I'll continue avoiding the surgery *smiles* You're in my prayers darling girl! I feel for you! Hope you are up and feeling better soon. Praying for you!! I sure hope you feel better soon! Sounds like your wonderful family has everything under control until you get better. I'm not sure it was wise to keep your wisdom teeth this long. Sorry I couldn't help myself. And I'm sorry to hear you may have to go back because she didn't take them all out. YUCK!! I hope you're not drinking out of a straw, you don't want a dry socket. Missy did a great job on your blog today. I'm surprise she didn't do a give away or two while she was at it! Hope you feel better soon. Can't wait to see the foyer. Hi Susie! Hope you are on the mend! Your sister did good! I have a little experience helping pull teeth: On two mission trips to Nicaragua I have worked with a dentist to pull teeth all day long for a week in VERY rustic settings.....no running water, etc. I didn't think I could stand the sight of blood but you get use to it! Get better soon! 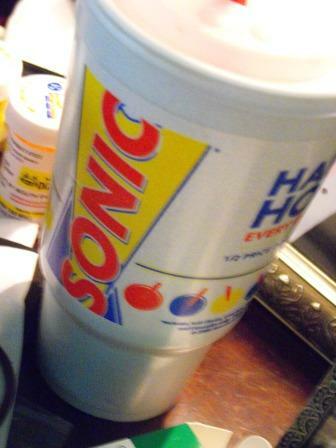 If I lived close, I would bring you a drink from Sonic!! Sorry to hear you're not feeling well. Enjoy the pampering ~ it looks like you're in good hands! For some reason, I love the picture of the Hub doing the laundry?! Poor Susie. Feel better soon. We miss you! So sorry you had to have your wisdom teeth out:( I have a horror story about mine also, but I won't share the gory details! I will say a prayer that you recover quickly. Thanks for touring my kitchen! Oh no! I'm so sorry you have to go back! I will be praying for you! Hi, thanks for the kind words about my kitchen cabinets! I hope you get to feeling better soon. I remember having my wisdom teeth out and I agree with you...I would leave the others in if possible! 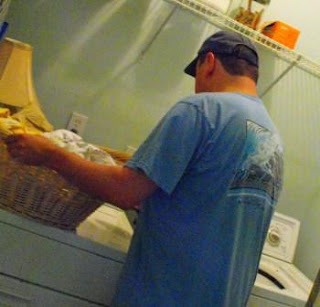 Take care and enjoy having the hubby do the laundry! That has never happened in my house. I can't wait to see what you did in the foyer! Hi, Susie! Thanks for dropping by my little kitchen recently! I loved your comment, and yes, I do like Melissa's blog, Stretch Marks, a whole lot! She is hilarious! I wish you could do some of your creative magic on my apartment! What talent Hope you are feeling better soon! Take care. Thanks for visiting my blog, I am going to take a look at your projects. I love the black doors on one of your posts! Thanks for your sweet comment! Hope you feel better soon! Hi Susie! Thanks for stopping by to check out my kitchen! Love your blog! Hope you are feeling well soon. Rest, rest, rest! Hi Susie. You are such a sweetheart! I cannot thank you enough for your kind comments on my blog today regarding my kitchen/home. Your compliment means the world to me. You might not remember me but I have actually purchased a couple of things off of you via ETSY for my home. (under Angie Seaman or Angelica Grace Designs) I love your items and always have. I didn't realize you had a blog though so I will now have to frequent it and become B/F/F's with ya as you mentioned. Ha ha! Again, thanks so much for stopping by and taking the time to comment. YOU ROCK! :) Keep in touch and I'll definitely do the same now that I know where to find you in blog land. oh, and i was hoping to come over and see you cheeks and all! I hope that you feel better soon & make sure that you are very careful drinking about drinking from straws...dry sockets can form from doing that & they are NOT fun at all! Oh my goodness! A tumor of your tooth?? I hope you feel better soon! Scary about the tooth part however twas a funny post. A little late in commenting but hope your feeling lots better...I know how you must have felt...I went through the same a few years back and it was not fun at all. This is SO funny....glad you can laugh. Try washing your hair with Dawn (as you can tell I've had the same problem Control prolactin hormone.